Fr. Stevo With his family! On Sunday, May 19th, 2013, our parish joyfully celebrated the 25th Anniversary of Fr. Stevo Rocknage's Ordination to the Holy Priesthood, which actually took place on April 17th, 1988 - then Thomas Sunday. The Church was packed with family, friends, and kumovi of Fr. Stevo, and he was joined at the Holy Altar by his son, Fr. Christopher, and his brother-in-law, Fr. Tom Gallaway. After the inspirational Paschal celebration, everyone enjoyed a cocktail/appetizer event downstairs in the Church hall, before the formal banquet began at 1 PM. Joining Fr. Stevo at the head table were his parents, George and Mika, his dear wife, our Protinica JoAnn,his son, Fr. Christopher, as well as his Dean, Fr. Stepanov, and his other Brothers-in-Christ: Fr. Malich, Fr. Merick, Fr. Kosic, Fr. Torbic, Fr. Gallaway, and Fr. Dragan Filipovic. The food was excellent - thanks to our dear women, led by Dee-DeeBaskot, and the music was provided by our own Orkestrar Pobeda. The highlights of the banquet were many, too numerous to mention (including gifts from all parish organizations, and clergy), but two of the most memorable were: Fr. Stevo's children, Fr. Chris, Mileva, and Dushan "reprising" their 'gift of love' 25 years ago by presenting Fr. Stevo with a hand-written Icon of the Nativity of Our Lord, since we all know of Fr. Stevo's love of Christmas; and, then, to the utter shock of Protinica JoAnn, and to the delight of all in attendance, Fr. Stevo honored his dear wife of 36 years with a beautiful Anniversary ring, reminding all of us (and her) that as our "Matushka" - .Mother of the Parish', she has served as a 'co-minister' in these years, singing at most of the Church services, and always working diligently behind the scenes, whether it be for nut-rolls or the Village. Her love, her dedication, and her willingness to be 'with' her flock, not 'over' them, was recognized by all as she was treated to a standing ovation and an emotional singing of "Mnogaja Ljeta" by all! After many speeches, it was time to enjoy the music of Pobeda again, and everyone basked in the Paschal Glow of Love and Joy on this special day! Our youth group together with members of our choir travelled to four local personal care homes to share the spirit of the Christmas season with some of our older members who are no longer able to actively participate in the life of our parish community. The day was an uplifiting and emotional one as traditional Serbian Christmas carols filled the halls of: Kane Regional Center (George/Alona Evanovich, Mara Gasparovic), Locust Grove (Boja Kecman), Independence Court (Smilja Blagovich) and Golden Heights (Mimi Pavlovich). Our parish celebrate a milestone in our History with the consecration of new icon stained glass windows on our 110th Anniversary. Our parish celebrated our patronal feast day on Sunday, January 30 immediately following the Divine Liturgy in the Church Hall. Kumovi for this year's slava was our St. Sava Men's Club. On Sunday August 22, Deacon Christopher Rocknage was ordained to the Holy Priesthood by His Grace Rt. Rev. Dr. Mitrophan, Serbian Orthodox Bishop of Eastern America. 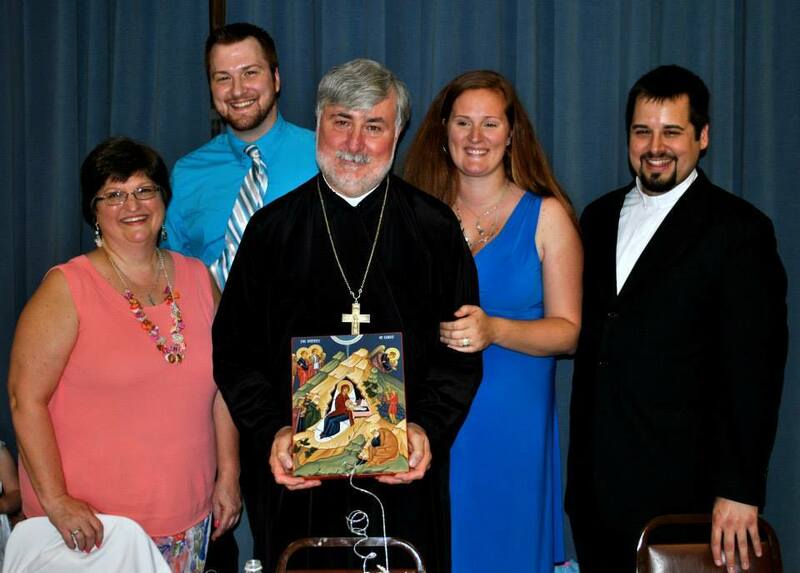 Father Christopher and Popadija Andreja will serve the parish community of Holy Resurrection Serbian Orthodox Church in Lebanon, PA.
Friends and neighbors gathered during the week of August 16th at Renziehausen Park in McKeesport, PA for the 51st Annual International Village. Thanks to all of our parish community who came out to help during this week. Thanks to you our annual fundraising efforts were successful again this year! For the first time in our 108 year history, our parish family witnessed the ordination to the Holy Diaconate of a son of our parish- Christopher Stephen Rocknage. Through the ancient and beautiful rite of Laying on of Hands, His Grace Bishop Dr. Mitrofan of the Eastern Diocese invoked the Holy Spirit to , "Heal that which is infirm and to complete that which is lacking..."
A reception immediately followed the Hierarchial Liturgy in honor of the newly ordained Father Deacon Christopher and his wife Andreja. Our parish celebrated our Patronal Feast with a delicious banquet in the Church Hall immediately following the Divine Liturgy. The school children, ages 5 – 18 presented a wonderful program with most children memorizing their declamatcia ~ approximately 150 people shared in the fellowship of our St. Sava Day program. Immediately following the Divine Liturgy on Sunday, January 24th, the parish council and all officers of our supporting organizations took the oath of office. During the brief service, Proto Stevo exhorted all officers to act in "one mind and one spirit" in unity and in love, keeping Jesus Christ as the focus in all their actions and all their decisions. On Saturday, January 23rd, the Brady family hosted a breakfast for the youth group in their North Huntingdon home. The teens enjoyed a buffet of scrambled eggs, bacon, potatoes, bagels and fruit. Proto Stevo and youth group advisor Joyce Yovetich attended the January meeting which was also held. The group discussed recent activities and planned ways in which they could help the victims of the recent earthquake in Haiti. Our Church School Advent Party was held on Sunday afternoon, December 27th. The weather cooperated and we had a nice turnout. Students, parents, teachers, family and friends shared a delicious lenten covered dish dinner, after which they were treated to a wonderful play about The Nativity of Christ. At the end of the play, St. Nicholas visited the children with treats and complimented them on a wonderful performance. This year's International Village was held at Renzie Park in Mckeesport, PA on Aug 18-20. This was the 50th Anniversary of the village. Our parish has participated in the village for nearly all of those 50 years! We are grateful to all of our parish family who turned out to help this year. Those who came earned the benefits that fellowship and stewardship have to offer in return for a little of their time and talents. Although the rain dampened our sales on the second day, it did not dampen our enthusiasm! An Advent Fish Fry was held on Friday Dec. 5 and Friday Dec. 12 at the Church Hall, located at 901 Hartman Street in McKeesport, PA.